This panoramic tour will enable you to explore the Orkneys with ease, from the relics of the First and Second World Wars on the South Isles, to the stunning West Mainland, a World Heritage Site. You will discover an island with a wealth of breathtaking views, interesting stories and treasures from the past. From Kirkwall harbour, we travel through the beautiful countryside of the East Mainland of Orkney and along the south-eastern coast of historic Scapa Flow, the main naval base of the British Navy during the First and Second World Wars. Then we cross the first of the four Churchill Barriers, causeways constructed during the Second World War to protect the eastern access to Scapa Flow and to connect the South Orkney Islands to the Mainland. This takes us to Lamb Holm Island, where we visit the hand-painted Italian Chapel. 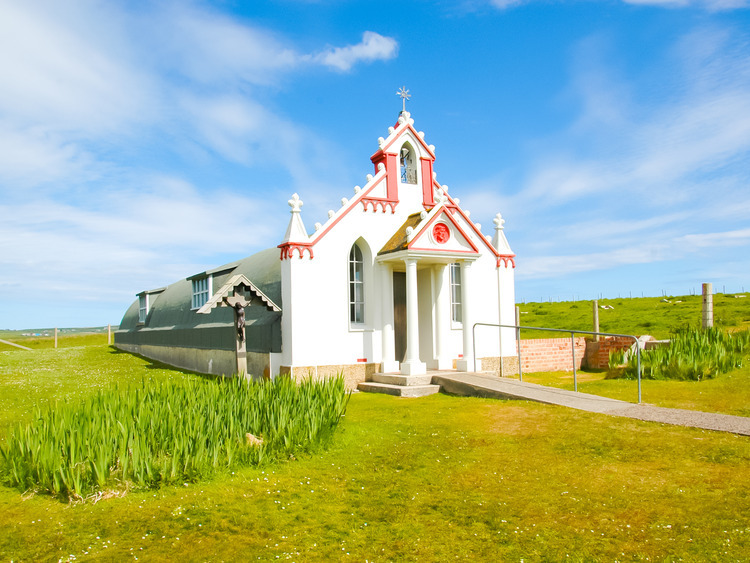 Built by Italian prisoners during the Second World War, the Chapel has been preserved as a symbol of hope and peace in times of conflict and a symbol of the lasting friendship between the Orkney Islands and the Italian soldiers. We move on towards West Mainland and the Heart of Neolithic Orkney, a Unesco World Heritage site since 1999 that includes a series of Neolithic monuments found in this area. We will pass by the site of the Standing Stones of Stennes. Dating back more than 5,000 years, this archaeological treasure is one of the oldest stone circles in Great Britain. Finally, we board our coach to continue along the north-west coast of the historic Scapa Flow. We can take photos of the impressive landscapes, while our tour guide tells us the dramatic war stories which make this natural port one of the most well-known in the world. We return to our ship moored in Kirkwall. Due to the recent deterioration of the coach parking of Stenness, the photo stop at the Standing Stones will be substituted with a slow drive past of the stones and a stop in Stromness which is a pleasant Harbour town.